These honey bees are looking for a new home. The queen is somewhere in the middle of this cluster. One of my colonies of honey bees swarmed today. (Click here to see me capturing this swarm on video.) This time they decided to land on a nearby fence rail. In the past, all the swarms I have captured have chosen to land on tree branches. 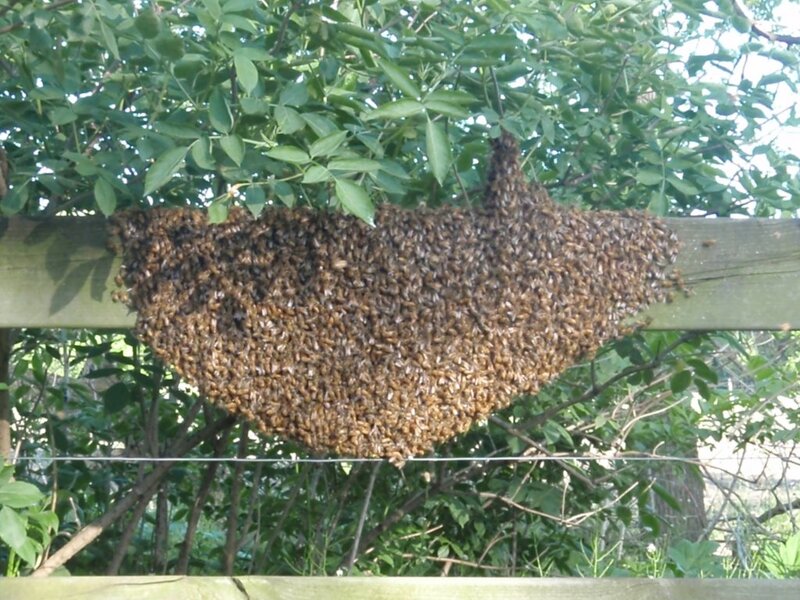 My visions of a bumper crop of honey disappeared at the sight of the swarm. 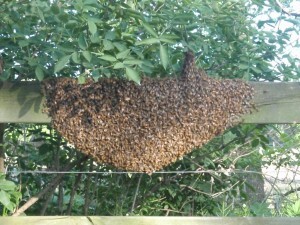 I have never actually seen a swarm of honey bees while they were leaving their hive. I have been told it is an awesome act of nature to witness. I typically find swarms after the fact, when the cluster of bees has come to rest somewhere. For the beekeeper that wants to maximize honey production, a swarm is bad news because instead of a strong colony spending all its energy on making honey, they spend energy on reproduction instead. 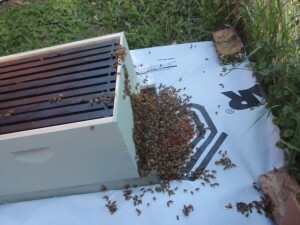 Swarming is the natural method of reproduction for honey bee colonies. If the colony is strong it may choose to swarm. Half of the bees and the old queen will leave the hive in search of a new home. They typically alight nearby for a few days while scout bees search for a suitable home to move into. The bees that stay behind raise a new queen by feeding a worker bee a high protein diet of royal jelly. When this new queen emerges she must go out and successfully mate. Thus two colonies are made out of one. This swarm of bees are fanning an attractant pheremone to call in the other workers. A good sign when capturing a swarm. There are a couple of things to keep in mind when it comes to capturing a swarm of honey bees. First of all the bees are looking for a new home. This means that they are not defensive because they have no home to defend. It is unlikely that beekeepers will get stung when capturing a swarm. I have captured a handful of swarms and never been stung in the process. The second thing to keep in mind is that if you provide the swarm a suitable home, they will probably stay. In this way, you can increase the number of colonies you are managing. These honey bees have been given a new home. The third thing to keep in mind is that the bees are ready to build a new home. 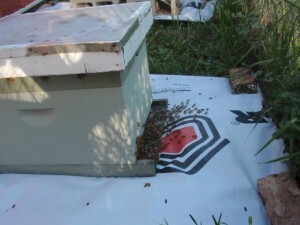 Swarms draw comb like no other starter colony you can obtain whether it be a package or a nuc. Place swarms on bare foundation or else place a honey super with bare foundation on top of a brood chamber. Then stand back and watch as the bees draw comb quickly. After a half an hour there are less honey bees outside the hive. Another good sign when capturing a swarm. After an hour there are very few honey bees left at the entrance of the hive. Definetely a good sign. These bees have moved into their new home. After you have captured the bees into some kind of container, you shake them into a new hive the same way you would if you were installing a new package of bees. 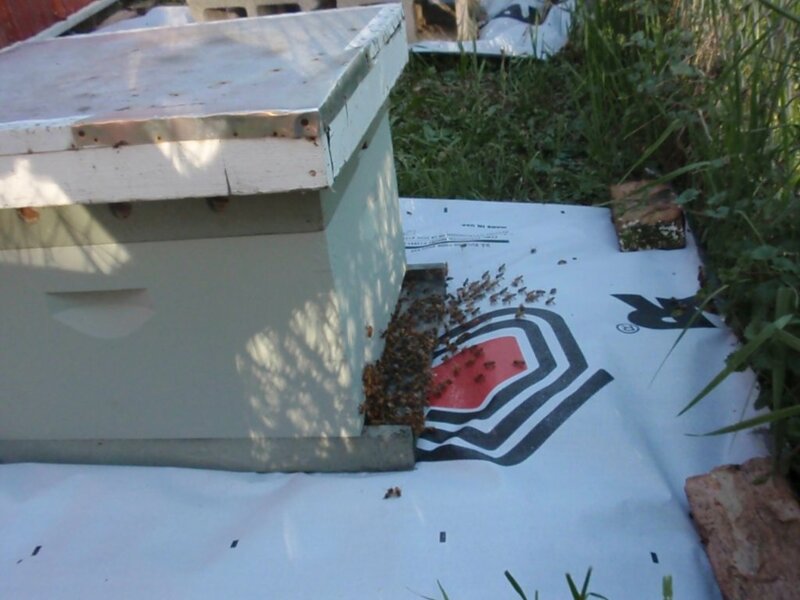 If you have captured the queen along with the workers, they will move in and signal to the other worker bees by fanning an attractant pheromone. They will thus call all the other bees into the new home. 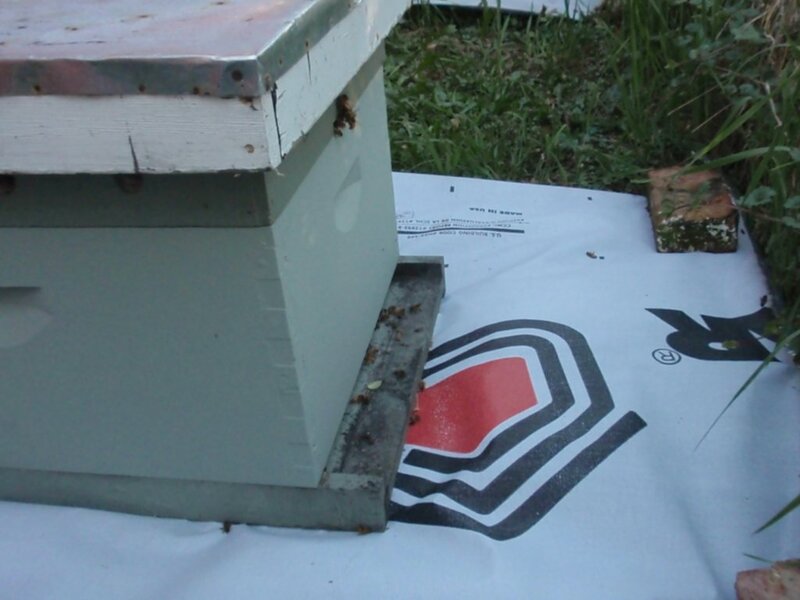 If you are going to keep bees, you should prepare for a swarm by always having at least one hive body, ten frames, bottom board, inner cover and outer cover in reserve. 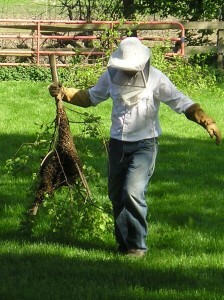 This will allow you to provide a new home to a swarm that you have captured. I learned this the hard way. My first year as a beekeeper, my colony swarmed while I was out of town on a business trip. You see, all the books say that first year colonies don’t swarm. Well, honey bees don’t read books. 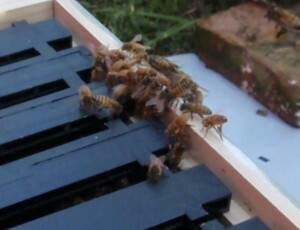 Thankfully, a member of my beekeeping club came over, captured the swarm and placed them in a spare hive that he had. Video of capturing this swarm of honey bees. Have you ever captured a swarm of honey bees? Tell me about it in the comments section below.